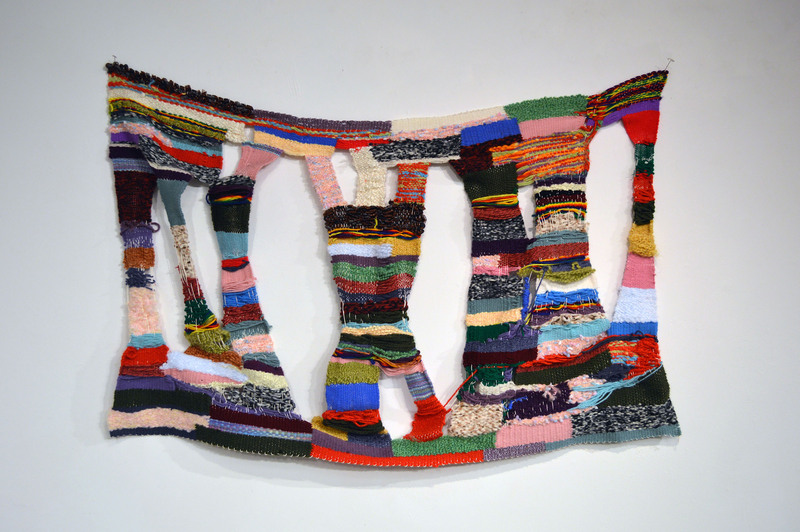 HAYS, Kan. – Students from the Department of Art and Design and individuals from Developmental Services of Northwest Kansas collaborated on a weaving project that is now on exhibit in the Schmidt Gallery at the Hays Public Library, 1205 Main St. The Special Rugs Collaborative Weaving Project began in October 2017 when Amy Schmierbach, professor of art and design, and her students, McKenna O’Hare, Oberlin junior, Alberto Hernandez Martinez, Garden City freshman, and Kendra Hall, Purdy, Mo., senior, began visiting the Reed Center weekly to weave with College of Living participants. The exhibit is open until May 20. Gallery hours are from 9 a.m. to 8 p.m., with the opportunity to participate in a raffle at the gallery. Raffle tickets may be purchased for $5 from 6:30 to 8 p.m. Friday, April 27, during Gallery Walk night at the Schmidt Gallery. The two weavings will be raffled off at 8 p.m.
Additional weavings will be available for purchase. Proceeds will go to the DSNWK arts programming.